Please call boat owner Don at 847-381-one zero three eight or 847-778-zero two seven eight. 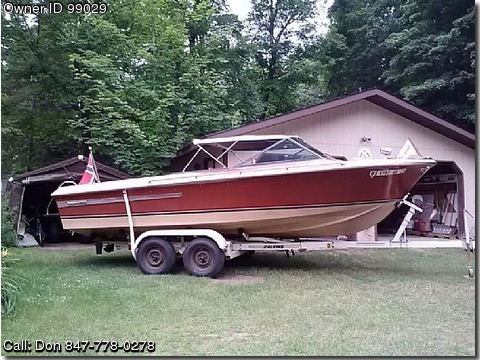 Boat is located in Minocqua, Wisconsin. This is a convertible canvas top, not a hard top, Coronado. All original except for a new helm and steering cable. Chrysler 440 has been completely rebuilt with only 25 hours, AM/FM cassette, Coast Guard pack, full gauges, storage, swim platform, Always stored indoors. Sits on a matching dual axle Calkins roller trailer with new tires. This boat has been professionally maintained.